When you’re trying to determine which product to buy, one valuable calculation to make is the total cost of ownership of the item. For example, if you’re buying a washing machine, it’s worthwhile to also include in the calculation the total cost of the energy you’ll use during the lifespan of the washing machine (as well as the water used). You look at washers and see that one uses about 0.1 kWh of electricity (and thus sports an EnergyStar logo), while another uses 0.45 kWh of electricity. This seems like a small difference, but it really adds up. Let’s say that electricity averages $0.15 per kWh nationwide. So, how much are you going to use your washing machine? With the numbers quoted above, you’re going to use that machine for 1,820 hours over its lifetime. The more energy efficient machine uses 182 kWh of electricity over its lifetime, costing you $27.50 in electricity. The less efficient machine uses 819 kWh of electricity, costing you $122.85. There’s a nearly $100 difference in the total cost of ownership of these two washers. What’s amazing is that this is a relatively undramatic example. For instance, if you compare a baseline water heater to an energy-efficient one, you’ll see savings easily approaching $300 in efficiency over the lifetime of an electric water heater and a savings of $500 over the lifetime of a gas water heater. The challenge here, of course, is finding all of the numbers you’ll need to calculate these things. This can often be a significant job, particularly for those who are challenged by calculations. From my own evaluation of the numbers, I’ve found that devices that don’t bother to carry the EnergyStar logo tend to not worry too much about energy efficiency at all and have quite poor energy use numbers. In other words, there seems to be an energy efficiency gap just outside the limits of the standard where no products are made, meaning products either make the Energy Star standards or don’t even come close. 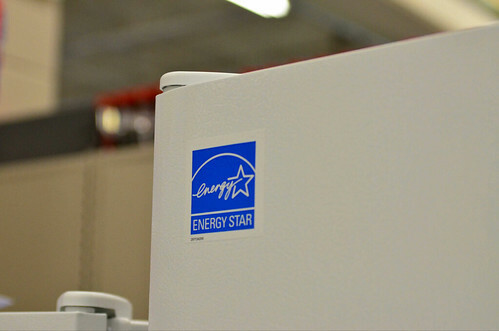 Almost always, the Energy Star logo is worth it, especially when you’re comparing otherwise similar models at the same price (which you can often see on store shelves). It’s also even worth paying a bit more for on heavy energy use items, like air conditioners and water heaters. It will save you money in the long run – and your future self will appreciate the lowered electricity bills.